Students of the Tuesday class performed Jolin Tsai’s “Rewind”. 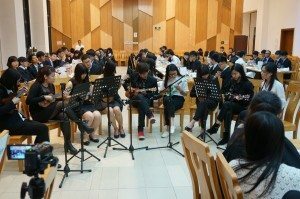 In this semester, Stanley Ho East Asia College held a ukulele course in which 30 students could take the opportunity to achieve their little music dream. 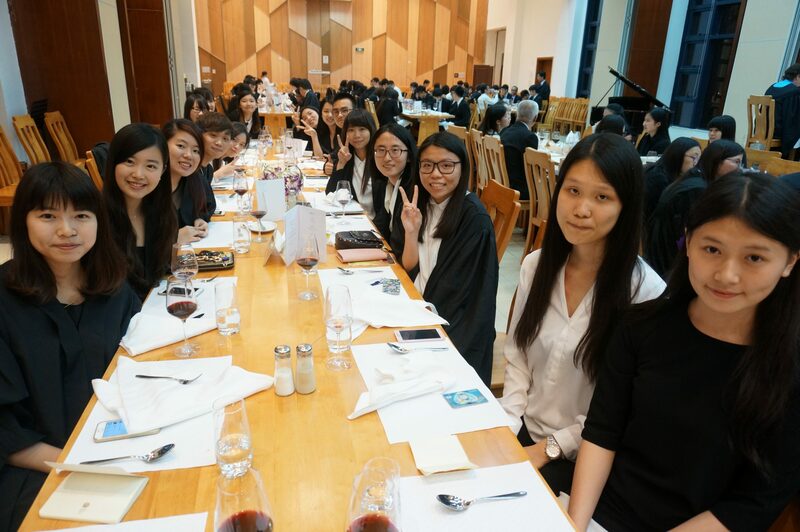 At the end of the course, the students performed together at the High Table Dinner on 23rd April. Due to popular demand, the ten-weekly-lesson was offered in two sections on every Tuesday and Thursday, respectively, commenced in the third week of January. The small class approach facilitated the interactions between the instructor and students, as well as among students. Everyone enjoyed the learning experience of ukulele in a flexible and stress-free atmosphere. 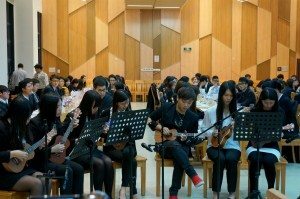 In the first seven lessons, participants was instructed the basics of playing the ukulele. For instance, the structure of the instrument, tuning, chords and melody, as well as basic right-hand playing skills formed the learning focus. During the last three lessons, participants practiced playing melodies in preparation for the performance. 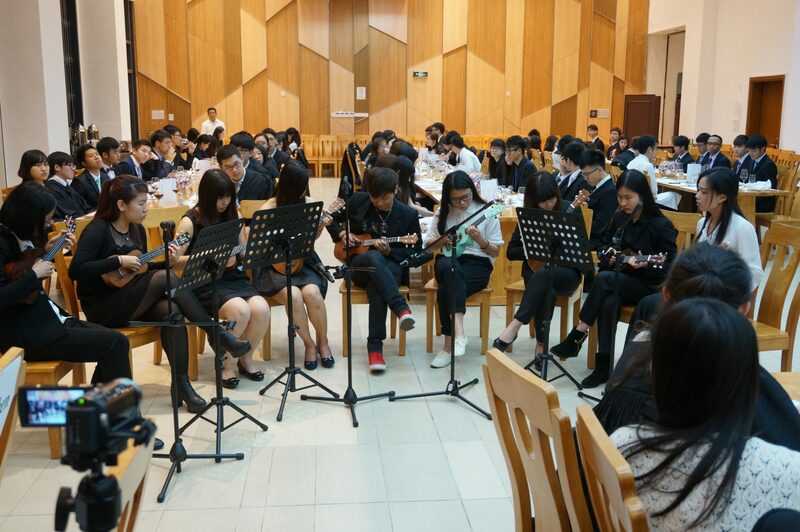 The ukulele students and instructor had an enjoyable night at the High Table Dinner. 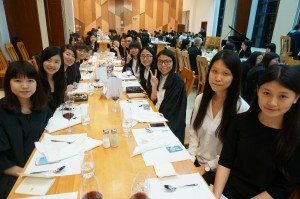 At the High Table Dinner, 14 students from the two sections performed two soft but vivacious pieces of pop music, namely, “Little Love Song” and “Rewind”. Despite a few minor “beginner’s hiccups”, their first open performance was well received by the audience. The course instructor told the participants that this performance was a good opportunity to assess their learning outcomes and to sum up the course. The College invited Mr. Ray Au as the instructor. Ray has more than 13 years of playing experience and 7 years of teaching experience. He is a member of a local famous band called “crossline”, with which he has performed in many shows of various scales and won a number of music awards. For those who are not familiar with music instruments, ukulele is a size-down version of a stringed instrument of Hawaiian origin. It is a member of the lute family of instruments and generally employs four nylon or gut strings or four courses of strings. Students of the Thursday class performed Sodagreen’s “Little Love Song”. 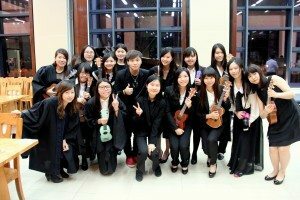 Group photo with the instructor after the High Table Dinner: Students were looking forward to the new series of ukulele course in the next semester.